I always imagine History Books Review listeners to be a young vibrant crowd of hip young gun slingers with smart trendy clothes, snazzy streetwise attitudes and great reproductive potential. So I have a feeling that not many of you will remember the spoof soap opera comedy series that was just called Soap. It was never a huge hit in the UK and I don’t know how well it did in the US where it was made. I do know I used to watch this late at night in the early eighties. Every show was introduced by a synopsis of the increasingly baffling events of the previous episodes, which ended with the phrase ‘confused? you will be!’. This came back to me as I tried to first of all, to work out what was happening in the aftermath of the resignations of Diocletian and Maximian, and secondly work out how on earth I was going to explain it all. Now I don’t wan to spend too much time on this chapter. At the end of the day, all it is really about is how Constantine came to be the undisputed ruler of the whole Roman world. The details aren’t that important in the overall scheme of things. But Gibbon’s account is a continuous narrative. And telling the whole story through all it’s twists and turns is one of the things that gives this work its pace and grandeur. So I will try and make it as straight forward as I can, as brief as possible but not cut any corners. First let us introduce Constantine, the man who the plot is going to increasingly revolve around as the chapter progresses, and one of the key figures in European history. He is also someone who gets talked about not only by historians, but by people with an interest in religion. So he is one of those historical figures that can’t be ignored. And as the man instrumental in bringing the world’s biggest religion out into the open it is hard to exaggerate his importance. But when we are first introduced to him at the start of Chapter 14 it is far from obvious that he is even likely to survive more than a few more pages. His father Constantius had been obliged to give up his wife to marry Theodora, the step daughter of Diocletian’s co-emperor Maximian. Constantine was his son by Helena, the woman who had lost out. Helena’s birth was obscure, both in the sense that she had a humble background and in the sense that we don’t know where she came from. We do know that Constantine was close to adulthood when the divorce came, so he had been brought up by Helena and he was to remain devoted to her throughout his life. With Constantius off in Gaul, Constantine and Helena were attached to the court of Diocletian. Constantius and his son obviously got on well and in a sense he was a sort of hostage for the good behaviour of Constantius. That was one of those things that probably everybody knew but nobody talked about. But he was not simply a courtier and fought in the war against Persia under Galerius, giving him the chance to show what he was made of. And what he was made of turned out to be a man with an instinct for the military. If Diocletian had it in mind to create a cadre of able leaders to run the empire after him – a very Diocletian sort of idea – he would certainly be able to congratulate himself on how well it was working out in the case of Constantine. There was another member of the same generation who also seemed to be destined for great things – Maxentius the son of Maximian. He didn’t get military experience like Constantine, which is odd given the personality of his father. But nonetheless he was the son of an emperor and so had a good claim on the throne. Another man in the circle was Flavius Valerius Severus – or just Severus. He had an army background and no obvious connection to any other member of the imperial circle apart from being a good friend and supporter of Galerius. Gaius Valerius Galerius Maximinus, or Maximin for short was son of the sister of Galerius. This just about qualified him for imperial status on its own, but to cement the deal Galerius adopted him as his own son as well. Looking at this list the obvious succession plan for Diocletian would be for Constantius and Galerius to succeed as Augusti and for Constantine to be Caesar to his father in the West and for Maxentius to do the same for Galerius in the East. For some reason, Diocletian didn’t do this and instead promoted Severus to the rule of Africa and Italy under Constantius, and placed Maximin under Galerius in the East. This had the effect of putting Galerius in a very strong position with both the junior members of the tetrarchy being strong supporters. 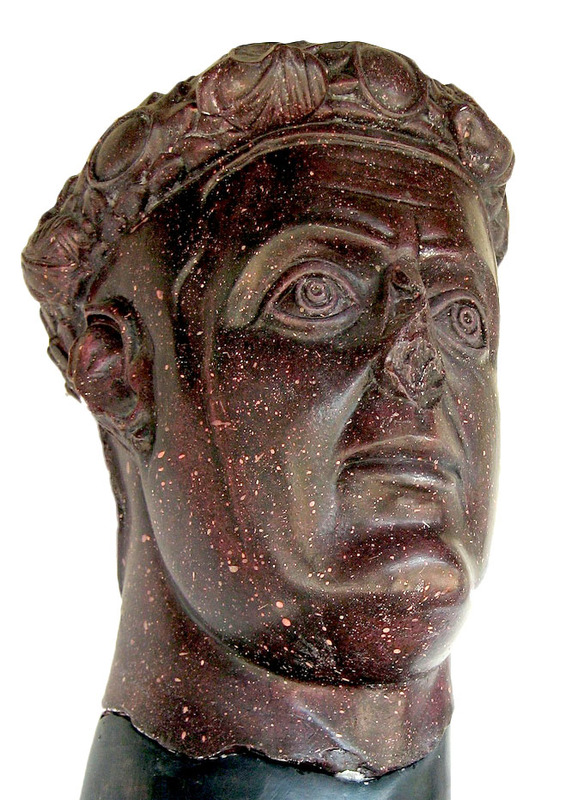 It was also widely known that Constantius was not in the best of health, so this left him with the prospect of total effective control of the empire very shortly. What was Diocletian thinking when he did this? It is easy to criticise with hindsight, but Roman politics were complex and nobody knew them better than did Diocletian. Bad as the outcome of his actions were, it is entirely possible that any other course of action would have been even worse. But Diocletian was ill and possibly demob happy at the time. Maybe he just gave in to the demands of Galerius for a quiet life, or perhaps he was deliberately engineering a situation where one emperor was so clearly the leader. Whatever, the situation this turn of events put Constantine in was precarious. He was at the time with the army in the East under the direct command of Galerius. The character of Galerius was not above disposing of an inconvenient rival while he had the chance. But Constantius was well aware of the situation and immediately requested that Constantine be returned to him on the pretext of needing him for the upcoming campaign in Britain. It was not easy to answer the summons, but Constantine got the permission of Galerius while he was drunk and in a convivial mood. His trip across the whole of Europe started first thing the next morning and was done at the fastest speed possible in case Galerius changed his mind. One colourful detail in some accounts has him hamstringing the horses in the posts after he had used them to prevent pursuit. This is certainly untrue,as a moment’s thought will prove. The last thing Constantine would have wanted to do was to draw attention to himself. It was nonetheless a dramatic flight. Constantine caught up with his father in Boulogne just as he was about to set out for Britain. Eagle eyed listeners will remember that the conquest of Britain was celebrated by Diocletian in the last episode. What is the explanation for this discrepancy? I don’t know. The reconquest of Britain took place in 297 and Diocletian’s triumph was in 303. I think Gibbon must have got that bit wrong. In any event, Constantius was not long for the world. He died at York in 306. He has left a good name behind him. He gets plaudits from contemporaries for his plain manners and being an old style citizen emperor rather than the divinely ordained monarch act played by Diocletian. He was conscientious and his military exploits were solidly successful and left his portion of the empire in good shape and well defended. With the monsters around him in power at the time it wasn’t perhaps too hard to shine, but he had been popular. It was no surprise therefore that his son was immediately proclaimed as emperor by the troops. Thanks to the situation he was in charge of more legions than would have normally been stationed in Britain. And he also had a ready made ally in the form of Crocus, a king of the Alemanni who had been helping with the campaign. Galerius may have regretted letting Constantine slip away but he was soon preoccupied with more significant problems, so he grudgingly recognised the fait accompli. The appointment of Severus as the emperor in charge of Italy had not gone down well with the Romans. The new emperor had continued to disrespect Rome by basing his administration in Milan. Adding injury to insult, there was also a question of taxation. For five hundred years the Romans had lived free of taxes. Galerius decided it was time for them to put their hands in their pockets. Imperial courts and armies don’t fund themselves after all. Losing political freedom was bad enough. Losing prestige – well that was bad too. Hard cash? Now that is serious. And given that there were no records of tax collection in Italy the first stage was assessing what everyone was worth. Not the kind of activity likely to endear one to one’s subjects. Especially as the accuracy of declarations of personal wealth were sometimes extracted using torture. Maxentius was approached and persuaded to proclaim himself emperor. On hearing this, who should turn up but his dad, Maximian who also agreed to resume the purple. So Italy now had two very credible emperors. The Praetorian Guard were on board. They had been the people who probably lost out most by the new trend for emperors to steer clear of the capital. The undue influence the guards exercised by menacing the person of the emperor himself only worked when the emperor turned up to be menaced. Severus had been out in the East when all this kicked off, but rapidly returned to sort it out with an army including some Moorish cavalry. He found the city defended by Maximian. Maximian was also the man who had originally recruited the Moors. It wasn’t therefore too difficult for Maximian to win them over to his side. Severus was forced to retreat to Ravenna. Ravenna was a good choice. It is well defended by natural barriers from the land side and was strongly fortifed. If you go there today the approaches are dominated by Venetian fortifications from much later but the Roman defences must have been pretty good too. Later it was to serve as the capital of the Western Roman Empire largely thanks to its strong defensive position. With control of the sea and a well defended city to house his troops, the position of Severus was not too bad. Maximian soon realised that a siege was unlikely to work. He always preferred violence when it would work, but he was willing to use guile when necessary. He managed to undermine the confidence of Severus in his supporters and persuade him to surrender himself without a fight in exchange for a promise not to do him any harm. Incredibly, Severus fell for it. Some people just aren’t cut out for the life of a Roman emperor. Maximian killed Severus straight away. Galerius himself now felt the need to assert his authority and invaded Italy with the express intention of wiping out the Senate and its supporters. But Maximian had defended the province with good effect. This coupled with some bribery to encourage desertions was sufficient to force Galerius to abandon the campaign for now. Maximian had proved himself many times in battle. He now showed a shrewd sense of diplomacy and statecraft. He opened contact with Constantine and traveled north to establish an alliance. He took his daughter Fausta with him. Things went well and Constantine and Maximian’s daughter got married. Maximian promoted Constantine to the rank of Augustus. The Western half of the empire was now united under three different Augusti, all neatly related to each other. In the East Galerius promoted Maximin to Augustus level – although Maximin had already started using the title anyway. He also appointed a friend, Licinius, as another Augustus. So the East had three Augusti too. Gibbon’s title for this chapter is six emperors at the same time. And here we are, the year is 308 and the empire has six, count them, six emperors. Let’s just whiz through those emperors again. In Egypt you have Maximin. He is a firm supporter of Galerius though not above promoting himself to Augustus rank when it looked like he was going to end up being the only Caesar left. New to the grid is Licinius – life long friend of Galerius and allocated Illyrica as his personal domain. In overall charge in the East and based in Nicomedia is the senior Augustus, Galerian. He obviously regards himself as the man who is the true successor to Diocletian. In the West the father and son team of Maximian and Maxentius based in Italy. Maximian was an old exeperienced bruiser, his son had had a more sheltered life. The provinces of Gaul and Britain were in the hands of the able and ambitious Constantine. He didn’t have huge resources at his disposal but did have some experienced troops under his command. His apparently close relationship with Maximian was deceptive. His priority was his own career. Despite the fact that the empire was divided into two armed camps that had actually been fighting each other in Italy, the empire did still remain a single unit. So for now the empire was at peace though not at ease. Yes indeed, I remember Soap! And the comparison to this chapter is particularly apt. I especially like the part about how Maximin preferred violence but wasn't above using guile. Sorry, another one who's not so young any more, never was very hip, wouldn't know where to sling a gun, and has been a lifelong fashion disaster with zero reproductive potential. But I thought “Soap” was GREAT. I am glad that reference to Soap resonated with at least a couple of listeners.